How do ventricular assist devices work? With our products we support patients with heart failure worldwide - from newborns to adults. The human heart is a highly specialized muscle that consists of two halves. Each of these halves possesses one atrium and one ventricle. Each half is in charge of a separate circulatory system: the right half is in charge of the "small" pulmonary circulation, the left is in charge of the "large" systemic circulation. At the end of the large systemic circulation, the "used" oxygen-depleted blood passes via the upper and lower vena cava into the right atrium and then into the right ventricle. From there it is pumped into the lungs, where it is replenished with oxygen. The now reoxygenated blood passes via the pulmonary veins into the left atrium and on to the left ventricle. The blood is now pumped back into the large systemic circulation via the aorta (main artery). Here it is supplied with vital oxygen and nutrients by bodily parts such as organs and cells. A healthy heart is able to beat around 70 times per minute for a lifetime, and to pump around 70 ml of blood with every beat. A complex electrical conduction system controls the pumping processes. The sinoatrial node found in the right atrium delivers electrical impulses so the heart is able to beat. These impulses spread over the entire heart, triggering pumping movements by activating the particular muscles required. Heart failure denotes a condition in which the heart is no longer able to pump sufficient blood into the body tissue. Since too little blood is pumped, the organs do not receive enough oxygen or nutrients. Heart conditions can be congenital or they may develop during the course of a person's lifetime. What are the treatment options for heart failure? Depending on the severity and type of heart failure, medication could help, surgery may be necessary, or mechanical circulatory support might be used. In what cases can a ventricular assist device help? If the heart is so severely damaged that it can no longer adequately supply the organs with oxygen, it must be supported. A ventricular assist device performs the work of the heart partially or completely. Thus, this system allows for adequate blood flow and blood pressure. Dilated cardiomyopathy: heart muscle disease in which the heart is significantly enlarged. Because of significant dilation of the heart muscle, it is no longer able to contract adequately in order to pump sufficient blood. Ischemic cardiomyopathy: A single or multiple myocardial infarctions (heart attacks) weaken the heart muscle. The coronary arteries are then narrowed or occluded so that perfusion of the heart is greatly impaired. Post-myocardial cardiomyopathy: A heart muscle disorder in which, following recovery from heart muscle inflammation, the patient then develops another disease of the heart muscle. Myocarditis: An inflammation (mostly a viral infection) of the heart, resulting in heart failure. VADs are used on patients to bridge the waiting period until heart transplantation (thus called a "bridge to transplant"). Furthermore, VADs can serve as long-term therapy for patients for whom a heart transplantation is not a consideration (also known as "destination therapy"). In some cases the heart recovers to such an extent, due to the relief afforded by the VAD, that a transplantation is no longer necessary (also known as a "bridge to recovery"). ... the heart has the approximate size of the fist of its owner? ... during an average human lifespan, the heart pumps approximately 220 million liters of blood throughout the body? With the same volume of water it would be possible to fill almost 88 Olympic swimming pools. ... the heart never sleeps? Even when the body is at rest, the heart muscles are working harder than a sprinter's leg muscles during a race. Basically, there are two types of ventricular assist devices:implantable and paracorporeal or extracorporeal systems. An implantable VAD is designed to support the left ventricle. It improves the patient's quality of life by providing long-term support. Only one transcutaneous (skin-penetrating) cable exits from the body. The pump and all cannulae that connect it to the heart are placed inside the body cavity. 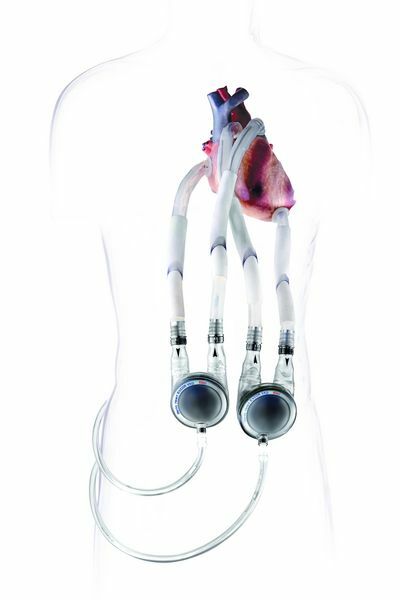 Here you can read more about the implantable ventricular assist device INCOR. A paracorporeal VAD can be used to support one or both ventricles. 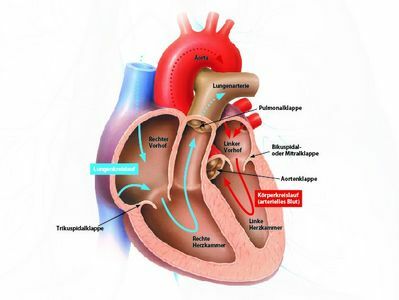 Paracorporeal or extracorporeal means that the blood pumps are located outside the body and are connected with the heart and blood vessels via cannulae. It is suitable for both short- and long-term support. 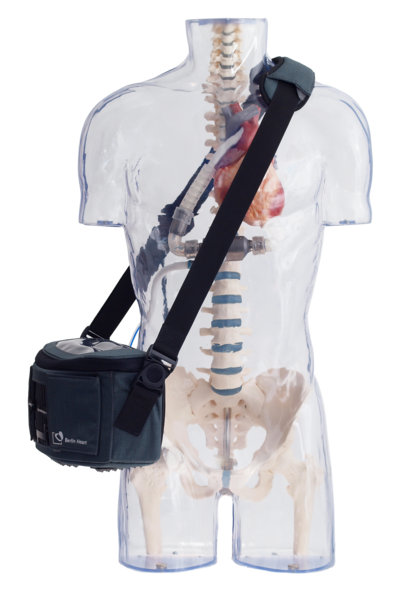 Here you can read more about the paracorporeal ventricular assist device EXCOR.